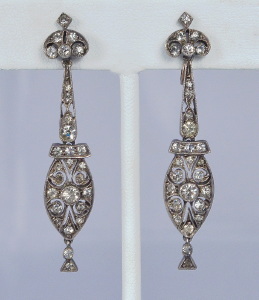 1910's vintage Edwardian era earrings. Lightly burnished sterling, paste and 10K gold. Delicate sterling open-work filigree setting sprinkled with paste. Three articulated section drops. Stylized button at screw backs. Marked STERLING earring back, 10K on screw backs. All original Edwardian era, true 1910's vintage. In 1996 we were privileged to provide rental wardrobe to the Fox/Paramount production of James Cameron's TITANIC. It is without a doubt, one of the most exciting projects we have ever been associated with. These earrings were selected personally by the costume designer as a significant accessory piece and intended to be used on camera in foreground or for principal. This is the first time it is being offered for public consideration. Included with the purchase is a copy of the original Titanic rental inventory page listing the item & photo copy authentication between the production and Repeat Performance, documenting specifically item RP#75-155JLE, the identifiable inventory number of the earrings. Excellent condition. Shows just slight discolor at a couple of stones, completely commensurate with age.